Greenville's Criminal Defense AttorneyI am William G. Yarborough Attorney at Law and from my law office in Greenville, South Carolina, I represent individuals throughout Greenville, Spartanburg and Anderson counties as well as the rest of Upstate South Carolina who face criminal charges involving DUI, white collar crimes, drug offenses, violent crimes, and other felony and misdemeanor offenses. 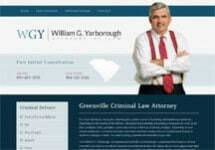 I am William G. Yarborough Attorney at Law and from my law office in Greenville, South Carolina, I represent individuals throughout Greenville, Spartanburg and Anderson counties as well as the rest of Upstate South Carolina who face criminal charges involving DUI, white collar crimes, drug offenses, violent crimes, and other felony and misdemeanor offenses. From my experience as a former Assistant U.S. Attorney and state prosecutor, along with my experience as a former public defender, I have unique insight into the criminal justice system, allowing me to devise the most effective defense strategy possible to help you obtain the best outcome for your situation and achieve the justice you seek. I understand that even normally law-abiding citizens can sometimes find themselves facing criminal charges. For this reason, I established my law firm to better serve those in need throughout my community. Personable and compassionate, I promise to treat you with respect and dignity as I address your questions and concerns to offer you some peace of mind about your situation. I will also remain by your side throughout all legal proceedings to be the guiding light in your moment of darkness and uncertainty. Do not trust your future to just anyone. For the serious legal matters that can affect your life and the lives of your loved ones, you need an aggressive advocate on your side who is totally devoted to protecting your rights and preserving your freedom. By contacting me at my law office and scheduling a free initial consultation, you can discover how I, William G. Yarborough Attorney at Law, can best serve you in your time of need.